All aboard! A smiling blue steam engine is pulling into Disney Junior this spring with the premiere of the animated special Thomas & Friends: The Adventure Begins. Debuting Saturday, May 23 at 6:40 p.m. ET, the hour-long adventure reveals Thomas’ origins as he arrives at his new home, the beautiful Island of Sodor, and encounters a fantastic fleet of new friends. The special airs prior to the official network launch of the series, Thomas & Friends, which begins on Sunday, May 24 at 10:30 a.m. ET, and serves as the caboose to an exciting evening of family programming, beginning at 5 p.m. ET with the feature film Finding Nemo. Thomas & Friends: The Adventure Begins takes viewers on a journey to where it all began, chronicling how Thomas first arrived on the Island of Sodor and how he became the “Number 1” engine. The one-hour escapade follows Thomas as he explores his new home, meets some “Really Useful” new friends and discovers the true blue meaning of hard work and friendship. Based on the classic books, “The Railroad Series,” Thomas & Friends follows the daily adventures of friendly and loyal engines Thomas, James, Percy, Emily, Henry and Gordon, and their firm but friendly conductor boss, Sir Topham Hatt. The engines help each other overcome obstacles with perseverance and bravery as they strive to keep the Island of Sodor running smoothly. Each episode features two animated stories, a live-action segment and a music video – all designed to delight children with timeless life lessons about the importance of discovery, cooperation and friendship. 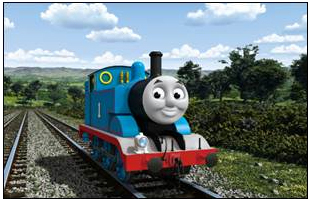 New episodes of Thomas & Friends will air regularly Saturday and Sunday at 10:30 a.m. ET. Disney Junior OnDemand will also offer new episodes as they become available beginning June 1. The voyage continues at DisneyJunior.ca, where parents and kids can discover hours of fun on the brand new Thomas & Friends supersite. Activities include fun colouring sheets, crafty cutouts and the magical new game “Tangled Rail Tales,” where Thomas fans can put a series of scrambled story scenes in the correct order to create an exciting adventure. The series was created by Britt Allcroft and is produced by HIT Entertainment. This entry was posted on Friday, May 8th, 2015 at 8:25 am and is filed under National News. You can follow any responses to this entry through the RSS 2.0 feed. You can leave a response, or trackback from your own site.